Sarah Bodman, whose popular Artists' Books column provides a regular look into the world of artists' publishing, picks her ten favourites of the year. The NewLights Press was established in the USA in 2000 by artist Aaron Cohick. Dedicated to printed matter, NewLights publishes editions of experimental writing, poetry chapbooks, artists’ books and broadsides using letterpress, relief and risograph print processes. The role of the book and its readers in the world is a key concern of the press, along with socially engaged printmaking. It published its third Manifesto earlier this year, along with this beautiful, subversive book, described as a ‘noise’ alphabet. 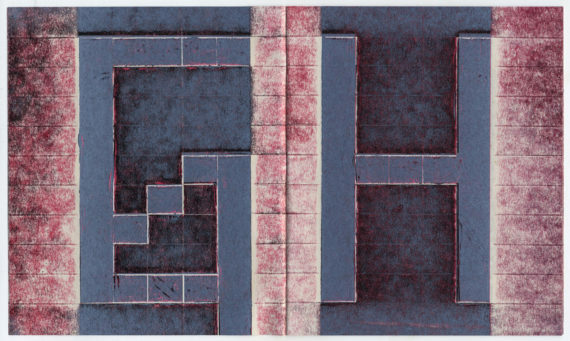 A 28-page, handprinted edition of 250, collagraph blocks on newsprint, it is a perfect example of NewLights’ art publishing practice; creating provocative, intelligent, democratic multiples that debate our relationship with the printed page and its contents. 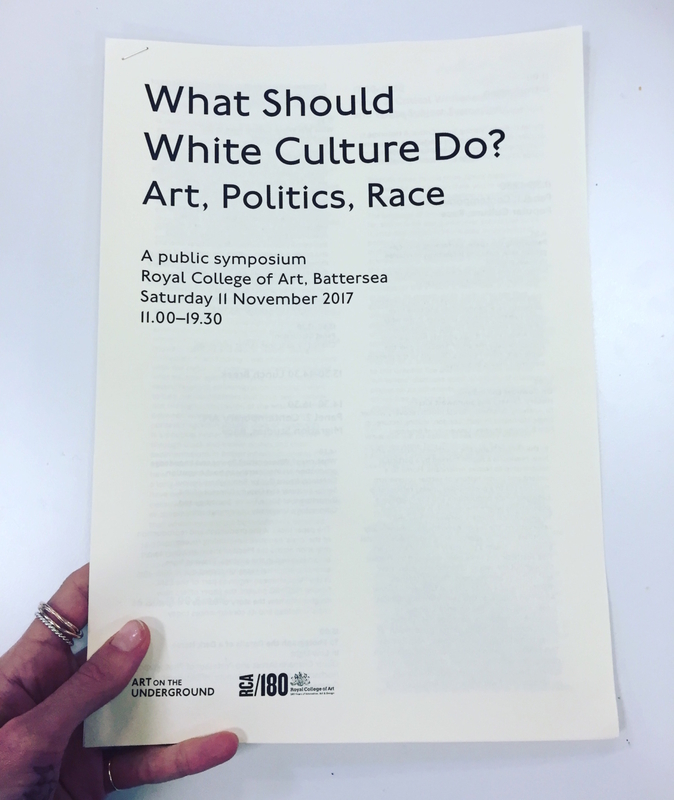 I noticed this book at the first Cardiff Artists’ Books event held earlier this year at The Printhaus, hot off the press from exhibitor kitbooks. Chris Lloyd makes editions of screenprinted and photocopied books that explore and celebrate the absurdities of life, from biscuit name origins to global warming. This one’s Orwellian sounding title was taken from a handwritten sign in a local launderette’s window. 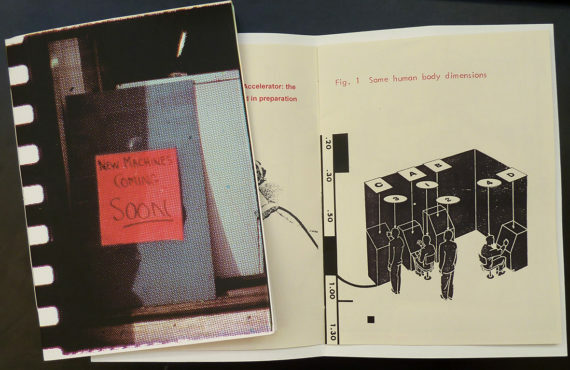 Texts from operational manuals have been collaged and interspersed with diagrams screenprinted by the artist. These include examples of terrifying workplace accidents, including the giant EP32 Bacon Slicer, and suggested operating instructions for the ‘new human interface man-machine’. A collective letterpress bookwork by 25 artists, poets and printers from the Nordic countries, POSTED / UNPOSTED launched at Bergen Art Book Fair in October 2017 and is touring Europe and the USA until 2019, as a Codex Polaris production. Codex Polaris was founded in 2014 by Imi Maufe, Randi Strand, Rita Marhaug and Sarah Jost to promote the artists’ books activity taking place in Norway, and is now expanding to other Nordic countries. The next project is a curated collection of Nordic artists’ books under the ‘CODEXnordica’ umbrella to showcase at the Codex Foundation’s 2019 book event in San Francisco, USA. 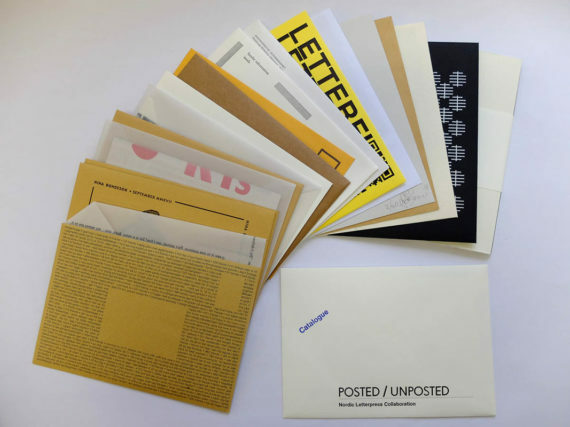 ‘POSTED / UNPOSTED’ is coordinated by Bergen-based British artist Imi Maufe and Lina Nordenström of Grafikverkstan Godsmagasinet, Sweden, both book artists who share a passion for creative letterpress printing. 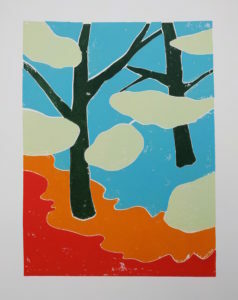 Visit the website for details of upcoming events and images of individual contributors’ works. One from a new series of A6 bookworks for the London Centre for Book Arts by artist Daniel Lehan. 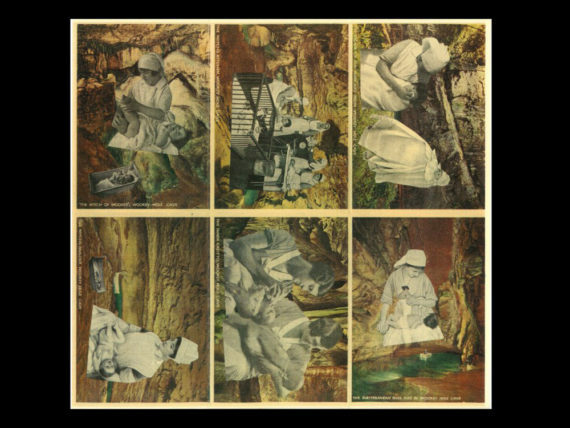 Lehan is an accomplished collage artist who makes small editions of books to show alongside his unique collaged works. Lehan’s surrealist books play with our expectations of language and image; they follow the format of a nostalgic guidebook or souvenir postcard book but they aren’t quite right. Juxtaposing images and texts meticulously cut from medical health books, vintage magazines and gardening guides, they amuse and beguile in their mix ups of flowers, castles, aliens and showgirls. Look out for his upcoming exhibition at bookartbookshop, London in the new year, which will show original collaged works and launch some new artists’ books. 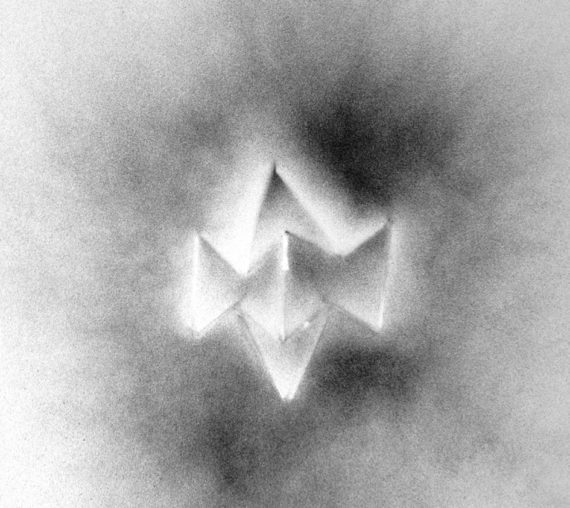 Les Bicknell has been artist in residence at the Centre for Doctoral Training in Nanoscience and Nanotechnology at Cambridge University throughout 2017. 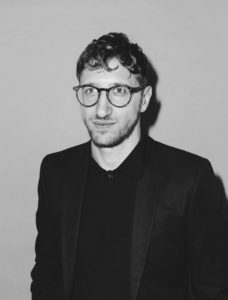 His project explores the relationships between science and art, looking at connections between the thinking involved in nanotechnology and the creation of artists’ books. He has been working alongside scientists and research students, creating a new body of work that engages with these concepts. Bicknell has long considered the idea of ‘bookness’ in his practice, researching sequence, time, order, etc. This new body of work continues his explorations through manipulation of matter at the labs, resulting in a series of experimental bookworks that make the ‘invisible visible’. The first in a new series of artists’ books by Otto utilising his invention of the ‘Crosscut-fold’ which allows him to create pages that turn at unexpected angles yet fold together to make a postcard-sized book. This results in surprises along the narrative path – as often found in Otto’s books – which reward the curious reader with a pull-out poster when flaps and folds are investigated. This science fiction-based series imagines escaping the dark and narrow tunnels of London’s waterways to emerge into space, exploring the cosmos on a boat. The artist points out that ‘there are perhaps echoes of H.G. Wells’ War of the Worlds, which features Regents Canal’. 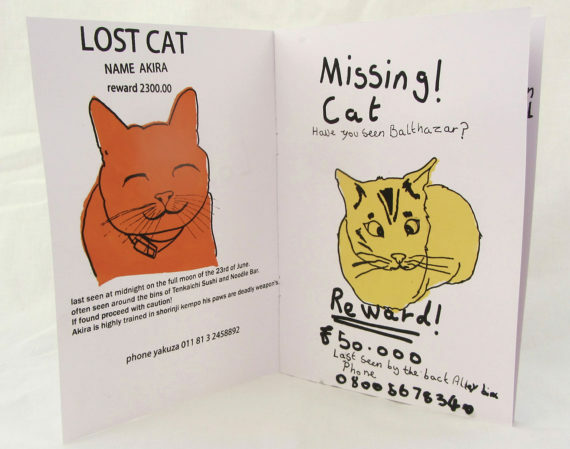 A hand screen printed book, inspired by a ‘lost cat’ poster spotted by the artist at the end of her road. These lost cats, however, answering to appellations such as Miss Margaret, Balthazar and Akira, have varying temperaments. Anthrax, for example, responds to ‘the call of the siren’ and was last seen ‘in the fires of hell’. The reward for finding him is a mere £2, whereas Akira, trained in the martial art of Shorinji Kempo, will bring a result of £2,300 – if you can catch him. The artist’s advice at the end of Lost Cat is ‘get a dog’. Although in the second title in the series, Lost Dog, she suggests you get a guinea pig instead. This is a proper Friday evening commute zine. 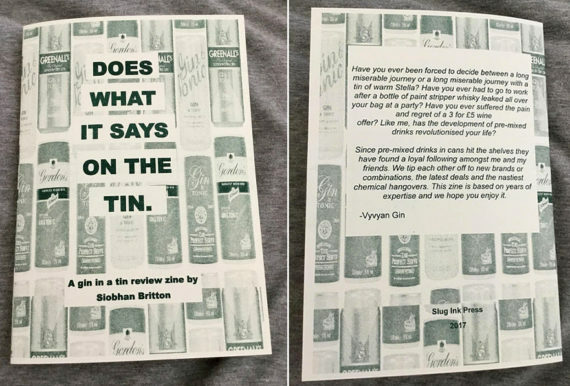 Britton has produced a consumer’s guide to the growing range of pre-mixed gin and tonic in cans, which she says are ‘surely one of the best inventions of modern times and have saved many a tedious journey or picnic’. It’s a witty consideration of the merits of each variety, which have of course been properly taste tested by the artist. Britton has broken down the elements to score on flavour, value for money, appearance and alcohol content; considering whether the drinker wants a classy experience or to quickly blot out their surroundings. 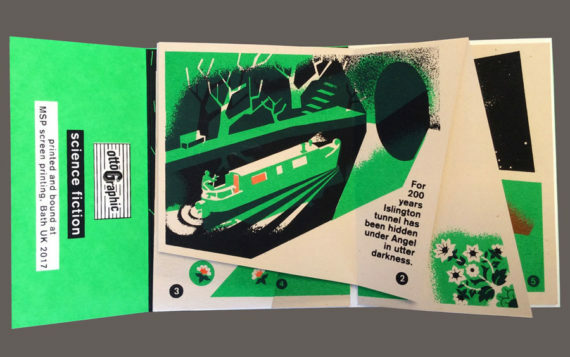 Riso printed in hunter green ink to match the traditional colour of gin products, it costs less than a gin and tonic to buy a copy. Published by Printed Matter in conjunction with Alatalo’s ‘Narrative in Revision’ exhibition this year, An Arranged Affair is a new iteration of her earlier book, ‘A Rearranged Affair’ (1996), a seminal work for which she took apart and rearranged the pages of multiple romance novels to form a new edition. Alatalo’s premise was that although the characters, places and dates may change page by page, the core elements in the plot of a traditional romance novel would survive as a plausible romance narrative. The original edition sold out quickly, so this version revisiting the idea in a new edition of 500, typed, edited and honed by the artist, is a wonderful treat for the many admirers of Alatalo’s publishing practice. 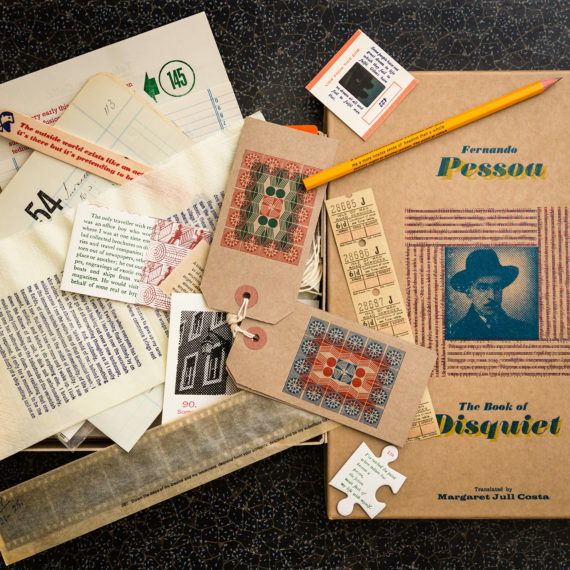 A wonderful, letterpress printed edition of fragments from Fernando Pessoa’s The Book of Disquiet, by London-based artist Tim Hopkins. This fragmentary edition reflects the disorder of the text as found after Pessoa’s death and is a perfect example of ‘liberature‘. This book project was a labour of love, taking more than two years to print on Hopkins’ small Adana press. Produced in an edition of 80, the box is crammed with hand-printed ephemera, a veritable treasure trove of discovery. It sold out within a month of its publication in March 2017 but you can view images and read about its history on the project’s website and on the MCBA International Artist’s Book Award site, which it deservedly won this summer.